The content of medicinal bioactive constituents in huangqi is affected by plant age. In this study, we devised a quick and convenient method for determining the age of huangqi, which was cultivated in Hunyuan County (Shanxi Province). 1, 2, 3, 4, 5, 8, 10 growth years huangqi had 38 samples, all samples were collected separately. The growth rings in these samples were observed after making paraffin section and freehand-section. The relationship between growth rings and its growth years was analyzed by SPSS 19.0 software. Histochemical localization of total flavones and saponins in huangqi was determined by color reactions. The concentration of four flavonoids and two saponins in the roots of huangqi of different ages and different organizational structure (normal roots and rotten heart roots) were determined by HPLC-DAD and HPLC-ELSD. The results were analyzed by SPSS 19.0 software. All huangqi samples had clear growth rings, and the statistical result about growth rings (X) and growth years (Y) showed significant correlation (r = 1, P = 0.000). The calibration curves of these six ingredients showed good linearity respectively, with significant correlation. All relative standard deviations (RSDs) of precision, recovery, repeatability, and stability experiments were less than 2%. Roots of 5-year-old plants contained the highest concentrations of total flavonoids and saponins. Saponin concentrations increased toward the center of the roots, whereas the four flavonoids showed an opposite trend in tissue distribution. The growth year of huangqi (Hunyuan County, Shanxi Province) could be determined soon and conveniently by naked eyes after staining phloroglucinol-HCl solution on freehand section. The content of saponins and flavonoids in rotten heart root and the surrounding normal tissues were affected by the formation and the extent of rotten heart. Astragali Radix, also known as huangqi, is a well-known Chinese herbal medicine. It is derived from the herbs Astragalus membranaceus var. mongholicus and A. membranaceus . The main active compounds in huangqi are polysaccharides, saponins, flavonoids, and various trace elements [2–5]. Huangqi has immunoregulation properties, cardiovascular and cerebrovascular protection, and anticancer, antiviral, antiaging, and antidiabetic effects [6–12]. Geo-authentic medicinal materials (Dao-di) are produced in the natural conditions and ecological environment, e.g., the cultivation, harvesting, and processing techniques, leading to enhanced quality and clinical effects, compared with the original plant . In the Qing dynasty, Shanxi Province became the Dao-di production area of huangqi , and Hunyuan County in Shanxi Province is currently one of the Dao-di production areas . The accumulation of certain secondary metabolites in huangqi is related to the number of years of growth . Consequently, the accurate and rapid determination of age is beneficial for evaluating the quality of huangqi. Growth rings have been discovered in the roots of many perennial herbs and have been used to identify plant age [17–22]. Growth rings have been found in huangqi and could be used to determine the age of samples . The bioactive constituents of medicinal plants are often concentrated in particular tissues of the root [24, 25]. The quality evaluation standard of huangqi in Chinese pharmacopoeia is the contents of astragaloside A and calycosin-7-glucoside . Flavonoid and saponin concentrations vary in the different tissue layers of huangqi [25, 26]. To date, however, there have been no studies that have investigated the influence of rotten heart on the distribution and concentration of bioactive constituents in huangqi. In this study, we aimed to identify the age of huangqi cultivated in Hunyuan County (Shanxi Province) using a convenient method and to profile the main bioactive constituents. Huangqi of different ages were collected for anatomical examination and analysis of biochemical composition. This multidisciplinary approach enabled us to determine the affects of age, rotten heart, and tissue on the concentrations of the main active compounds. Semi-wild huangqi of 1, 2, 3, 4, 5, 8, and 10 years of age was collected separately from Hunyuan County (Table 1) in September 2012. 1-year-old huangqi had 5 samples; 2-year-old huangqi had 8 samples; 3-year-old huangqi had 8 samples; 4-year-old huangqi had 8 samples; 5-year-old huangqi had 5 samples; 8-year-old huangqi had 3 samples and 10-year-old huangqi had 1 sample. The above-ground parts were retained as plant specimens. The roots were dried in the sun for experimental analysis. The roots of 8-year-old huangqi were categorized into normal roots and rotten heart roots. All samples were authenticated by Professor Huasheng Peng (School of Pharmacy, Anhui University of Chinese Medicine) with reference to the Flora of China . The internal standards calycosin-7-glucoside and astragaloside A were purchased from the National Institutes for Food and Drug Control (Beijing, China). Calycosin, formononetin, and astragaloside II were purchased from the Traditional Chinese Medicine Standardization Research Center (Shanghai, China). Ononin was purchased from Vic Biological Technology (Sichuan, China). Acetonitrile (TEDIA, USA) was chromatographically pure and the water was ultrapure from Milli-Q (Merck Millipore, USA). All other reagents were of analytical grade. Segments of the roots of 10-year-old huangqi (length 80 cm, diameter 2.9 cm) were cut transversely (5 mm thick) at 5-cm intervals from the root-head to the root-tail. These segments were used to prepare paraffin sections. The paraffin sections were prepared as follows: initially, the segments were placed in FAA solution (70% ethanol:formaldehyde:acetic acid, 90:5:5) for over 24 h. The segments were then dehydrated using a gradient series of alcohol, and thereafter embedded in paraffin. Subsequently, the embedded roots were serially sectioned at 10–15-μm thickness using a Leica RM2265 rotary microtome. The serially sectioned samples were placed on clear slides in a consecutive order and then baked for more than 24 h. Each section was then deparaffinized and stained with safranin-fast green and safranin reagent. The parenchyma stained green and the vascular tissue stained red. The microscopic structure of different parts of the root and the development of normal tissues and rotten tissues were observed by light microscopy (Leica DM6000B; Leica Microsystems, IL, Germany). Huangqi samples of 1, 2, 3, 4, and 5 years of age were used for microscopic examination of growth rings. Root segments were cut at approximately 2 cm from the root-head, excluding any rotten tissue. Parts of the segments were cut (5 mm thick), and from these, paraffin sections were prepared (as described previously) for light microscopic observation. Other parts of the segments were sectioned at 1-mm thickness by hand and stained with phloroglucinol-HCl. The growth rings in these sections were counted with the naked eye and also under a light microscope. Huangqi samples were sectioned using a freezing microtome (Leica CM1850 UV, 30–40 μm) at 20–40-μm thickness, and the sections were stained with 5% sodium hydroxide solution. After few minutes, the sections were observed using fluorescence microscopy (Leica DM6000B; Leica Microsystems, Fluo, Germany) with a green filter (Leica Microsystems, Germany) and an emission wavelength of 420 nm. Huangqi samples were also sectioned using a freezing microtome (Leica CM1850 UV, 30–40 μm) at 20–40-μm thickness, and the sections were stained with 5% vanillin-sulfuric acid solution. After few minutes, saponins may become red or purple. Sections for a negative control experiment were treated with 70% alcohol for 1 month to remove flavonoids and saponins. These sections were then stained with 5% sodium hydroxide solution or 5% vanillin-sulfuric acid solution, as described previously. Huangqi samples were classified into three categories based on the extent of rotten tissue: (A) “normal,” (B) “small rotten heart” (rotten tissue <1/3 of the total diameter), and (C) “large rotten heart” (rotten tissue ≥1/3 of the total diameter). Each category comprised three root samples. The normal and “small rotten heart” root samples were sliced (3 mm thick). The normal root slices were then divided into seven parts: periderm (Pd), secondary phloem (SPh) (outside to inside: SPh1 and SPh2), and secondary xylem (SX) (outside to inside: SX1, SX2, SX3, and SX4). The “small rotten heart” samples were partitioned using the same steps, but rotten heart (Ho) included the secondary xylem. The “large rotten heart” root samples were cut into six parts: Pd, SP (outside to inside: SPh1, SPh2), and SX (outside to inside: SX1, SX2) and Ho. All samples were crushed, dried at 60 °C, and sieved through a No. 4 mesh(diameter 250 ± 9.9 μm; Yu Ding Standard Screen Factory, Shaoxing, Zhejiang Province). In this study, we used the sample solution preparation method for Huangqi described in the Pharmacopoeia . One gram of sample powder was reflux heated in 50 mL methanol for 4 h. The reduced weight was then complemented with methanol and the extract was well hand shaken and filtered. Twenty-five milliliters of the filtered fluid was recovered and dried. The residue was dissolved in methanol in a 5-mL volumetric flask and methanol was added to the scale line. Four grams of sample powder was soaked in 40 mL methanol in a Soxhlet extractor overnight, and then reflux heated for 4 h. The filtered fluid was recovered and dried. The residue was dissolved in 10 mL water. The samples were then extracted four times with 40 mL of water-saturated n-butyl alcohol. The n-butyl alcohol–water extracts were then pooled and washed four times with ammonia solution. The ammonia solution was discarded after each wash. The n-butyl alcohol fraction was dried. The residue was dissolved with methanol in a 5-mL volumetric flask and methanol was added to the scale line. Each sample preparation was performed in triplicate. The samples were analyzed using an Agilent 1260 HP LC system (Agilent, USA), equipped with DAD and ELSD (Agilent) detectors. Flavonoids and saponins were separated on a Kromasil C18 column (250 × 4.6 mm, 5 μm; Sweden). For flavonoids, the mobile phase consisted of acetonitrile (A) and 0.2% formic acid (B) 0–12 min, 20–37% A; 12–16 min, 37–40% A; 16–22 min, 40–50% A; 22–28 min, 50%–95 A; 28–32 min, 95–20% A; 32–42 min, 20% A. The sample injection volume was 20 μL, the flow rate was 1 mL/min, and the column temperature was 30 °C. The UV detection was set at 254 nm. For saponins, the mobile phase was acetonitrile:water (36:64), and the flow rate was 1 mL/min. For ELSD detection, the tube temperature was 100 °C, and the spray chamber temperature was 30 °C. The carrier gas was N2, the flow rate was 1.5 mL/min, and sample injection volume was 20 μL. The column temperature was 30 °C. The standard curves of the HPLC method, the correlation between growth rings and age, and correlations between the concentrations of the six examined bioactive constituents (calycosin, calycosin-7-glucoside, formononetin, ononin, astragaloside A, and astragaloside II) and age were analyzed using SPSS 19.0 software. The T test we used was two-sided. P value <0.05 indicated that there was significant difference, whereas P ≥ 0.05 indicated that there was no significant difference. Data of the concentration of six compounds are expressed as the mean ± standard deviations. The information of experimental design, statistics, and resources used in this study are attached in Minimum standards of reporting checklist as Additional file 1. The typical secondary structure of huangqi from Shanxi Province consists primarily of a periderm and secondary vascular tissue (Fig. 1a). The periderm consisted of a cork layer, cork cambium, and phelloderm. 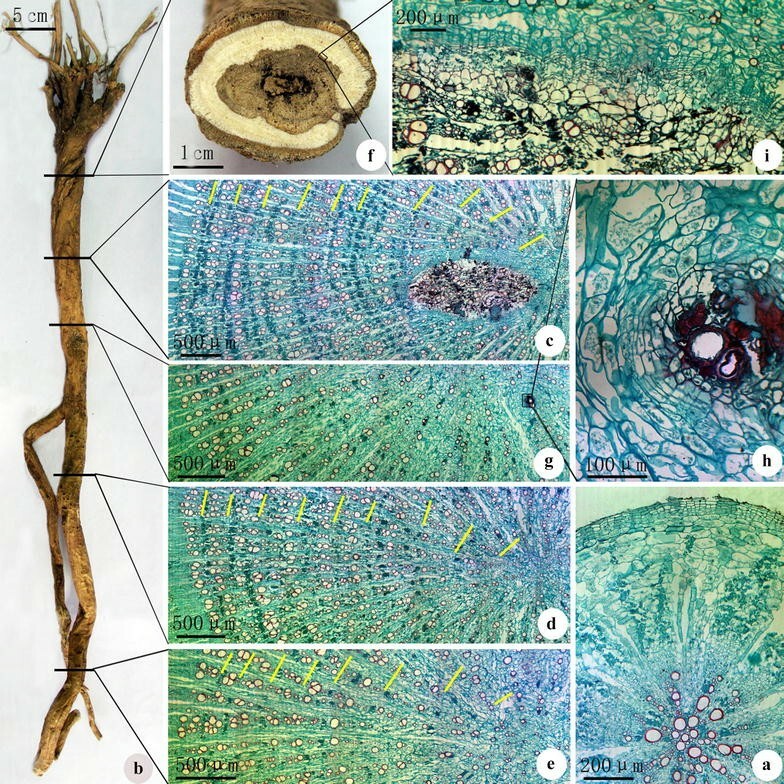 The secondary vascular tissue was developed and included secondary xylem, vascular cambium, and secondary phloem. The secondary phloem consisted of many fiber bundles. The phloem rays were curved, with fissures close to the periderm. The vascular cambium consisted of five to seven layers of cells forming a circular line. The xylem rays consisted of two to three rows of cells and several bundle-like wood fibers were observed. The vessels were individually dispersed or gathered into small clusters of two to six vessels. In the xylem, clusters of wide and narrow vessels were arranged alternatively as radial arrays. The clusters of wide vessels consisted of two to six large-diameter vessels, whereas numerous fiber bundles accompanied the clusters of narrow vessels. This alternating radial arrangement of wide and narrow vessels, together with the connection of vessels arranged in a tangential direction, forms very distinct growth rings. There were ten growth rings in the zone 20–40 cm from the root-head (Fig. 1b, c), nine in the zone 40–55 cm from the root-head, (Fig. 1b, d), and eight in the zone 55–70 cm from the root-head (Fig. 1b, e). Growth rings were evident from the root-head to the root-tail of huangqi, with the number decreasing toward the root-tail. Rotten heart is primarily composed of decaying root tissue, which is similar to the structure of the periderm. In thick huangqi, a rotten heart is typically found in the area <30 cm from the root-head (Fig. 1b, f). The circle of parenchyma cells surrounding the clusters of vessels in the secondary xylem was transformed into cork cambium (Fig. 1g, h). The cork layer extended inward, causing necrosis in the secondary xylem. The growth rings were, however, still clearly visible. The cork cambium in the secondary xylem may became inactive. However, the peripheral parenchyma cell layer was converted to new cork cambium, producing inner cork layers. As this abnormal cambium production continued, the abnormal cork layer gradually increased in thickness. This portion of the secondary xylem gradually progressed from necrosis to decay (Fig. 1f, i). After staining of the transverse sections with phloroglucinol-HCl, the growth rings became clearly visible red rings. The paraffin sections showed that the growth rings were composed of large-caliber vessels. These vessels were bound by clear layers of late wood (Fig. 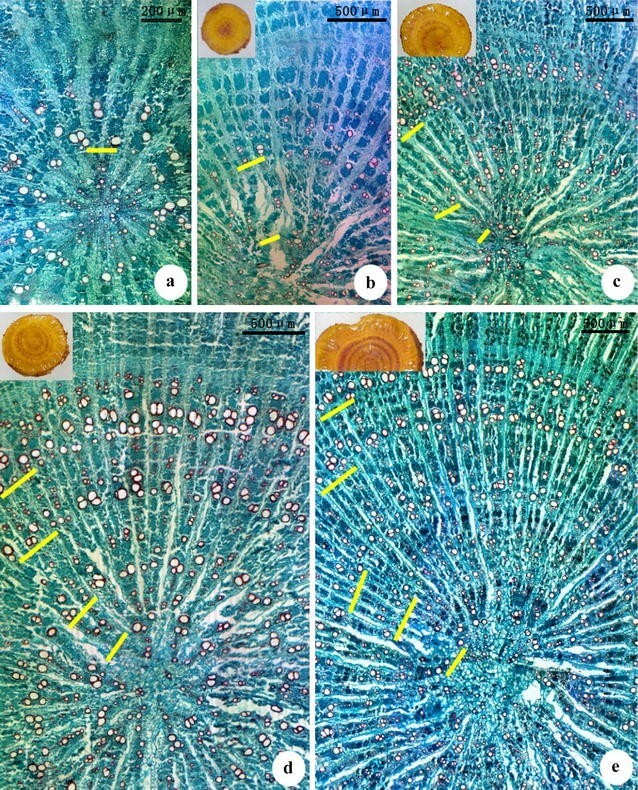 2), More growth rings were identified by light microscopy than by unaided observation because the innermost growth ring was barely visible with the naked eye after phloroglucinol-HCl staining (Table 1). In huangqi roots of less than 5 years of age, the number of growth rings observed with the naked eye after staining with phloroglucinol-HCl plus 1 was equal to the actual number of growth rings. SPSS 19.0 software was used to analyze the correlation between growth rings (X) and age (Y). The result showed a significant correlation (Y = X, r = 1.000, P = 0.000). Flavonoids and saponins were quantified by single-point calculation and two-point calculation (Additional file 2). The calibration curves of calycosin, calycosin-7-glucoside, formononetin, ononin, astragaloside A, and astragaloside II all showed good linearity, with significant correlation coefficient (Table 2). The limits of detection (LODs; S/N = 0.1) and limits of quantification (LOQs; S/N = 44) for flavonoids and saponins were <6 ng and 16 ng, respectively. The performance parameters evaluated were as follows: precision, recovery, repeatability, and stability at 0, 5, 10, 15, 20, 25, and 30 h. All relative standard deviations (RSDs) were <2%. Huangqi samples of different ages were analyzed by HPLC for the concentrations of four flavonoids and two saponins (Additional file 3). The correlations between years of growth and the four flavonoids were as follows: calycosin-7-glucoside (P = 0.88, r = 0.08), ononin (P = 0.848, r = −0.102), calycosin (P = 0.859, r = −0.095), and formononetin (P = 0.657, r = −0.233). There were thus no significant correlations between these four flavonoids and years of growth. Among these four flavonoids, formononetin was the most abundant and ononin the least for the sample ages examined (Fig. 3). Concentrations of the other two intermediate flavonoids were largely equivalent during this period. However, the amount of all flavonoids, with the exception of ononin, was two-fold higher during the 2nd to 5th year of growth than during the 1st and 8th years of growth. In contrast, the roots had similar saponins concentration during the first 5 years of growth, followed by proportional decreases in astragaloside A and astragaloside II concentrations in the 8th year of growth (Fig. 3). Astragaloside A was consistently the main saponin, with concentrations >threefold higher than astragaloside II. The SPSS analysis results for the relationship between years of growth and astragaloside A revealed a high correlation (P = 0.029, r = −0.909). The relationship between years of growth and astragaloside II also showed high correlation (P = 0.012, r = −0.858). Flavonoids were concentrated in the secondary xylem to a greater extent than in the secondary phloem (Fig. 4A1) compared with the negative control segments (Fig. 4A2). In contrast, saponins were concentrated to a greater extent in the periderm and secondary phloem than in the secondary xylem of huangqi (Fig. 4A3). Negative control segments showed no staining of the periderm, secondary xylem, or secondary phloem (Fig. 4A4). The different tissue layers in Huangqi roots exhibited different compositions of flavonoids and saponins. In normal roots, the total concentration of the four flavonoids (ononin, calycosin, calycosin-7-glucoside, and formononetin) decreased toward the periderm (secondary xylem > secondary phloem > periderm) and increased toward the cambium (Fig. 4b). Ononin, calycosin, and calycosin-7-glucoside showed the same distribution pattern, with concentration decreasing toward the periderm (secondary xylem > secondary phloem > periderm). In contrast, formononetin concentration gradually increased from the periderm to the cambium, with the highest concentration in the secondary xylem adjacent to the cambium. In the secondary xylem, however, formononetin concentration gradually decreased toward the center of the root. In the rotten heart roots, the distribution and total concentration of the four flavonoids were similar to those in the normal roots. However, in the rotten heart structure, the concentrations of the four flavonoids were proportionally lower than those in the surrounding normal tissue. In the periderm, flavonoid concentrations were not affected by the size of the rotten heart. In normal secondary xylem and secondary phloem, the total concentration of the four flavonoids in rotten heart root was significantly higher than that in normal roots. Calycosin-7-glucoside and ononin were not affected in the rotten heart structure; however, in normal secondary xylem and secondary phloem, calycosin and calycosin-7-glucoside concentrations increased with an increase in the extent of rotten heart. In normal roots, the concentrations of astragaloside A and astragaloside II in the periderm were significantly higher than those in secondary xylem and secondary phloem. The total concentration of the two saponins was higher in rotten roots than in normal roots and their concentration distribution in different tissues was dependent on the size of the rotten heart. The rotten structures accumulated the two saponins (Additional file 3). Total concentrations of the four flavonoids (ononin, calycosin, calycosin-7-glucoside, and formononetin) and two saponins (astragaloside A and astragaloside II) were determined by HPLC (Additional file 3). The flavonoids were not significantly affected by the development of a rotten heart (Fig. 5). In contrast, the concentration of astragaloside A in normal roots was approximately three times higher than that in rotten roots, whereas astragaloside II was not detected in rotten roots. The saponin concentrations of huangqi are thus selectively decreased if a rotten heart develops. The number of years of growth and the growth region both affect the quality of huangqi. Hunyuan County (Shanxi Province) is the main production region of Dao-di huangqi, which has a long lifespan. One growth ring includes one ring of larger vessels and one ring of narrower vessels. The larger vessels develop in the growing seasons (spring and summer), whereas the narrower vessels develop later (autumn). The growth rings in huangqi roots are located in the xylem [22, 23]. Huangqi from Hunyuan County has clearly visible growth rings, and the number of growth rings correspond to the plants’ real age. For huangqi that has been cultivated for less than 5 years, a very simple and convenient method for determining the number of years of growth is staining of hand-sliced sections with phloroglucinol-HCl, and observing with the naked eye. The concentration of two saponins (astragaloside A and astragaloside II) decreases toward the center in normal huangqi, whereas the concentration of four flavonoids (ononin, calycosin, calycosin-7-glucoside, and formononetin) showed the opposite trend. These results are consistent with the findings of a previous study . This contrasting trend in concentration distribution between flavonoids and saponins in different tissues could be a general characteristic of huangqi, regardless of the growth region or year of growth. In old huangqi plants, there is a high likelihood that the root-head will be hollow. The development of a rotten heart does not affect the distribution and accumulation of the four main flavonoids and two main saponins in normal tissue. However, in rotten heart, the concentrations of flavonoids and saponins were distinct from those in the surrounding normal secondary xylem. The concentrations of the four flavonoids in the rotten heart were similar to those in the periderm, but significantly lower than those in the secondary xylem and secondary phloem. As the rotten heart becomes larger, the distribution of flavonoids and saponins changed. The rotten heart in huangqi is typically removed before the medicinal compounds are extracted, which increases the concentration of flavonoids but decreases the concentration of saponins. Thus, the pharmacological activities of huangqi may vary depending on the extent of rotten heart, as a consequence of changes in the concentrations of flavonoids and saponins. The growth year of huangqi (Hunyuan County, Shanxi Province) could be determined very simply and conveniently by naked eye. The content of total flavonoids and saponins in huangqi reached the maximum at 5-year-old. The rotten heart in huangqi influenced the distribution and concentration of bioactive constituents. DYP and XMX substantial contributions to the conception or design of the work. JW, HSP and MEC analysis and interpretation of data for the work. JW and HSP drafting the work and revising it critically for important intellectual content. JW, ZL, ZHT and HYD final approval of the version to be published; All authors read and approved the final manuscript. The authors wish to acknowledge Liang-Ping Zha, Anhui University of Chinese Medicines. The readers can use data and materials in this manuscript by quotation of author names and Journal of Chinese Medicine. Raw data in Table 2 was summarized as Additional file 2. Availability of all of datasets in Figs. 3, 4 and 5 is summarized as Additional file 3. This research was supported by the National Natural Science Foundation of China (81573543) and the central project significant increase or decrease at the corresponding level “Rare traditional Chinese medicine resources sustainable utilization of capacity building” (2060302). 13020_2017_135_MOESM1_ESM.pdf Additional file 1. Minimum standards of reporting checklist. 13020_2017_135_MOESM2_ESM.xlsx Additional file 2. Raw data in Table 2. 13020_2017_135_MOESM3_ESM.xlsx Additional file 3. The raw data in Figs. 3, 4 and 5.